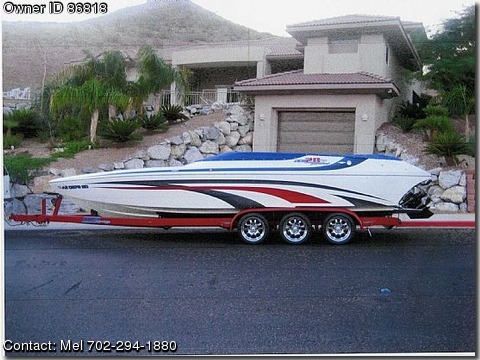 Contact Boat Owner Mel @702-561-8787 or mkoich@cox.net POWER:GT Marine 540 (540 ci,932 hp on pump gas,875 pft),the best parts money can buy. BOAT: White with custom red,grey and purple graphics.(DCES8010F001). DRIVE:Mercruiser,XR (Heavy duty gimble)w/4 blade (lab finished) 15 3/4 x 32 prop drive shower. TRAILER: Extreme (red) tri axle w/17"Centerline chrome billet wheels/Nitto tires disc brakes,all reccessed LED lighting,swing hitch (5DBUP303X1R000002). OPTIONAL EQUIPMENT: DANA Stage 2 fully hydraulic anodized trim tabs, IMCO full hydraulic (dual ram) steering, Dual Batteries (DANA billet cases) new 2012, Stainless Steel Braded lines throughout, On-Board charging system, Upgraded Sound System w/10 disc changer, Custom cabin inside lights, Bimini top with custom boat graphics, Full boat cover,water repellent (grey) and Custom cockpit towing cover (purple), Fully upgraded Gaffrig gauges, Too many additional options to mention.